The area shaded red was originally owned by the Earl of Carnarvon and the area shaded blue by the Lamin family. 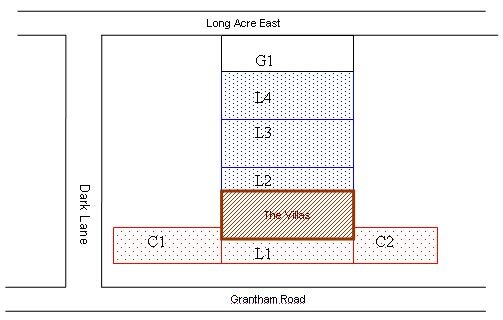 William James Lamin bought L1 (about one third of an acre) from the Earl of Carnarvon in July 1905, presumably to provide access from Grantham Road, and therefore development potential, to the Lamins’ property (L2, L3 and L4) as G1 (bordering Long Acre East) was not owned by the Lamins. In 1906 the Lamin’s (William James, his brother John Harvey and their sister Mary Ann) sold L1, L2 and L3 (in total about one and a half acres) to the builder James Walker. They seem to have retained plot L4, maybe to sell to the owner of G1, as at this point it would have become inaccessible. Walker then built the four pairs of villas on plots L1 and L2, a total of around half an acre), reserving right of carriage along a drift road through the middle of the property, to retain access to plot L3. We can only suppose he planned to build more villas behind the present ones. In fact he never did, and this plot (along with G1, L4 and adjacent plots) now forms Raymond Drive. The abstract of title reveals the history of ownership prior to 1905, and some names occur in deeds previously studied. Indeed, this abstract adds useful new details. C1, L1 and C2 made up plot number 241, coloured red on the 1901 Ordnance survey map (left). This land was owned by the fifth Earl of Carnarvon by virtue of his father’s marriage to Evelyn, daughter of the sixth Earl of Chesterfield. 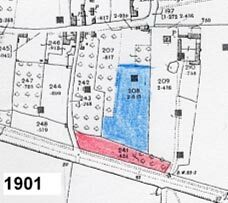 L2, L3 and L4 made up plot 208, coloured blue on the 1901 map and amounted to just over two acres. The abstract records that a half-share of this plot originally belonged to James Harvey. He was a tailor who in the late 1820s built and lived in 1 Market Street, the deeds to which record his eventual indebtedness to Ann Mabbott, he having borrowed £400 against the security of that property. The abstract for 51 Grantham Road reveals Harvey’s further indebtedness to Mrs Mabbott, for another £400. An indenture of 15 February 1868 recorded that ‘J Harvey was already indebted to Ann Mabbott in the principal sum of £300 and had requested her to advance and lend him the further sum of £100’. The dates do not tally with the loans recorded against 1 Market Street, so one must conclude these loans were additional. We know that by 1853 Harvey was listed in directories as a beer seller not a tailor, and one might conclude that he was in the process of going bankrupt! Ann Mabbott also owned 15 Fairfield Street, and was described in censuses of the time as a proprietor of houses. He also half-owned a cottage in Fisher Lane which was included in the security for the loan. 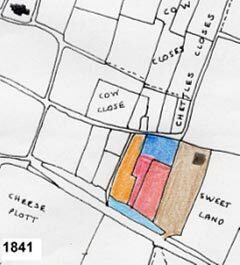 We do not know the precise positions of Clifton Close or Sweet Laides (the conveyance for the houses suggests Clifton Close was the western part) but the 1841 Tithe Award plan does show a piece called Sweet Land adjacent to the plots involved. 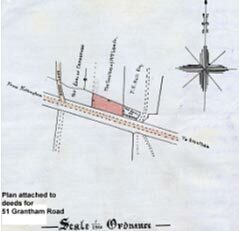 The plots shown on this plan tally moderately well with those on the1901 map. The access road indicated on the tithe plan, and east of the plots in question, is shown on the 1900 map as the track to the farm that once overlooked Crow Close. This land is east of the plots described and thus implies this was Chettle’s farm. Harvey died in February 1862. His executors were John Doncaster and William Lamin, revealed in these papers as his son-in-law (which we had rather assumed but could not demonstrate at the time the history of 1 Market Place was researched). Ann Mabbott died in June 1863. Her niece, Sarah Drinkwater, was executrix (see also 15 Fairfield Street). The abstract then recites a curious set of events: ‘The sum of £400 and interest was repaid during Ann Mabbott’s life time (on 21 April 1863) but there had been no reconveyance (of the property securing the loan)’. Thus Walker’s executors could not prove they now had title to the land! They agreed to pay £200 to Mabbott’s estate and the other £200 was paid by Ann Lamin at the request of the executors. Ann Lamin was William’s unmarried (census 1881) sister and lived in East Bridgford with her younger sister Frances. Title was then assigned to her. When Ann Lamin died, in July 1893, she left the land to her nephews John Harvey Lamin, William James Lamin and Mary Ann Lamin, children of William, her brother and the original John Harvey’s son in law. In 1893 John Harvey Lamin had bought 1 Market Street, his uncle’s old house which he sold in 1903 to Edwin Hitchcock the watchmaker. At that time he moved to Radcliffe. By the time of the sale of the Grantham Road plots he was living in West Bridgford and was still described as a banker’s clerk. The 1896 directory notes John Lamin was a clerk with Wright and Company's Bank in Nottingham. The picture is completed by the details of the will of William Lamin, of Saxondale, who died in June 1888 and left a half share in the property described as ‘half those 3 acres of land called the Sweet Laides with half (of) one and a half acres called Clifton Close…’ - the land in which John Harvey, his father in law, had held the other half interest. Thus the moieties were restored to a single ownership. The property was to be divided equally between his three children – James Harvey, William James and Mary Ann. In July 1905 William James Lamin bought the strip of land between Clifton Close and the Grantham Road from the Earl of Chesterfield for £70. This is the only transaction for which a plan was drawn up. The piece measures 1 rood and 2 perches – just over a quarter of an acre. also those two pairs of semi-detached dwelling houses erected by the vendor upon the said combined area of two pieces of land and partly standing on one and partly on the other of the two pieces of land and now in the occupation of Mssrs Lumby, Wright, Jalland and MacArthur. The reference to existing tenants suggests Mary Ann bought the houses as an investment perhaps sometime after they had been built. We have so far found no trace of Lumby, Jalland or MacArthur. It was not uncommon for a house to be conveyed after occupation but it might of course indicate the houses were actually completed before 1910 and initially let by Walker. To have left the land undeveloped for three years seems a bit unlikely, although it might have been an opportunistic purchase whilst he was engaged elsewhere. The conveyance gave the right to use the two roadways mentioned – a right since extinguished with the development of Raymond Drive. It also notes that (as was usual) the Earl of Carnarvon had retained the mineral rights under the part that had been his. Mary Ann undertook to keep in good condition the ‘existing iron railings and other fencing intended to be erected along the northern, southern and eastern sides of the hereditaments and pay a due proportion of maintenance costs of the roads to the north and east of the hereditaments’ These conditions presumably relate to the drift road and the area of land Walker had bought and seemed to have been reserving for further building (L3 on the diagram). There were several White families (see appendix) in Bingham in the nineteenth century. One family was well established in Bingham. Robert and Charles (both first mentioned in the 1841 census) may have been brothers and related to the George and Samuel noted in the 1793/1832 directories. However there is a Samuel in another family who was probably not related to them, being born in Newark and not Bingham. He seems to have come to Bingham in 1854 to open his general dealership. The Mary Ann who bought 51 Grantham Road is unlikely to have been his wife, who was also a Mary Ann, but the wife of his son, also Samuel. The first Mary Ann outlived her husband and ran a marine stores and general dealers in 1889. She is not mentioned in the census of 1891. The second Mary Ann is thus the most likely one to have bought the property, perhaps when her Samuel died in 1909. Their son George Henry (also married to a Mary!) succeeded him in the business - S White and Son which continued trading into the 1940s, eventually running the steam mill in Station Street. George’s shop, bake house and accommodation were in what is now Cranmer House in the Market place. Mary Ann moved into Rosedene in 1911/12 (electoral roll for county and parochial elections in which women were eligible to vote). An abstract of title to two freehold dwelling houses (Rosedene and number 2 Grantham Road) was prepared in 1939 for the representatives of Mary Ann White, who had died in November 1939 aged 78. It recites the previous details and records that her executors were George Henry White and Elizabeth Annie White – her son and daughter. George Henry had also owned Cranmer House in the Market Place which his wife Mary White had bought in 1920 We do not yet know the history of ownership of the other two houses. When she died Mary Ann White was living in Rosedene – number 51. Title to the properties was vested in Elizabeth Annie White in January 1940. By this time Elizabeth was living at Rosedene and George Henry was at Woodlands, Nottingham Road, Bingham. Elizabeth Annie died in September 1943 and had appointed as executors George Henry (her brother) and Florence Ada Shepperson (her sister, wife of George Eric Shepperson). An assent to transfer the property records that they were empowered to sell the properties and divide the estate into three equal shares, which they then inherited, along with Elsie Maud Nicholson (another sister?) as beneficiaries. The assent carries an endorsement recording that number 53 was sold to John Heaney in February 1966. George Henry White and Elsie Nicholson sold their interest in the houses to Florence Ada Shepperson on 28th February 1944 for £400 (making them worth £600 in total - £50 more per house than they had cost Mary Ann White in 1910). Mrs Shepperson was already in residence. The name of the occupier of number 2(53) is not recorded. A further abstract of 1965 records the interest of the personal representatives of Mary Ann White to two freehold dwellings on Grantham Road. These are not defined by address, but as Rosedene and number 2 (now 53) were the subject of the transactions recorded above, these two would seem to be numbers 55 and 57. The abstract would have been prepared prior to sale, by the three executors/beneficiaries. A supplemental abstract records the interest of Elisabeth Annie, who had died previously to sale and presumably had left her share to her family. The deeds for these other properties would reveal more. On 13th February Mrs Shepperson’s executors sold Rosedene to Mr and Mrs Wheelecker for £2250. They in turn sold Rosedene on 30th October 1981 to Paul Francis Manzi for £24000. The houses are deep and therefore larger than they appear from the road. Number 51 has a bay window on the western side not repeated in the design of the other houses. This would have given an uninterrupted view of Bingham to the west, as well as the view to the north afforded by a rear window (common to all the houses). Architectural details, such as the decoration of window lintels, vary between the two pairs west and east of the drift road, suggesting that perhaps the easterly ones were built a little later.